That’s how many zeroes? The cost of entitlement programs | Drake in D.C. The afternoon and night was all budget all the time at The Washington Center. One theme throughout our conversations with staff at The Concord Coalition and The Committee for a Responsible Federal Budget was the federal budget’s main expenditure: entitlement programs. 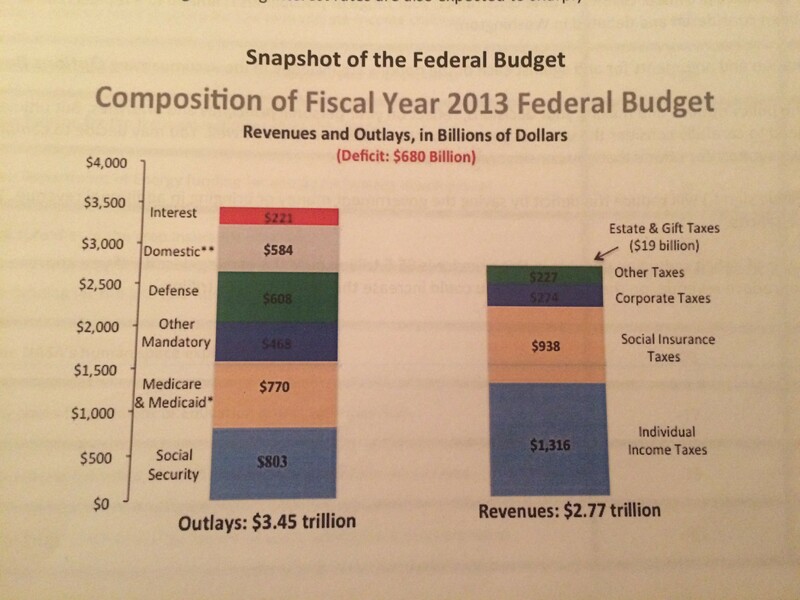 As you can see below, Social Security and Medicare and Medicaid are the top three costs in 2013’s budget. Social Security provides monetary benefits to retirees, the disabled and the unemployed. Medicare provides health insurance to Americans over 65-years-old, and Medicaid supplies health insurance to lower income families and individual. Social Security cost $803 billion in 2013. Medicare and Medicaid ran the U.S. government a sum of $770 billion. Together, it all cost $1.573 trillion ($1,573,000,000,000). For how much the federal government spends on those programs, I could do the following: produce the most expensive movie ever (Pirates of the Caribbean: At World’s End) 4,602 times; buy the world’s most expensive car (a 1962 Ferrari 250 GTO) 41,394 times and match or surpass the 2013 GDPs of 181 countries. One reason the costs have risen so much is that people are simply living longer. The longer someone lives, the longer he or she receives Social Security and Medicare benefits. Baby Boomers are just now 65 and retiring, qualifying for both programs. Unpopular fact alert: Old people are a serious drag on the U.S. economy. Not only do they not contribute to the work force anymore, but they’re taking more money than ever before from entitlement programs, strangling the budget. Not to mention, medical costs that Medicare and Medicaid have to cover are also on the rise. However, there’s no way a congressman or senator can vote to cut a substantial portion of something like Social Security and expect to win reelection. It’ll be hard enough to fend off the battalion of of seniors that show up on the Hill, brandishing their canes from the seats of their Hoverounds. In our exercise, we cut only minimal healthcare and Social Security costs. We were bold enough to raise the Social Security retirement age to 70, but that was about it. Much more and we would’ve risked our (fake) seats in Congress. We kept it all intact for now. Check back with me when I’m 65. « Is the Government Working?